Rafting in Nepal is popular tourism adventure trip in Nepal. Raft in Nepal provide you unique experience of Nepal river thrilling in white water. Nepal Rafting give an opportunity of beautiful landscape , green jungle, wild animals and through out rural Nepalese village. Nepal is best destination of white water river rafting & Kayaking. Nepal is 2nd largest country for water resources and has 1310 rivers among them 12 rivers are more popular for river rafting in Nepal. Trisuli rafting, Bhote Koshi rafting, Sun Koshi rafting, Seti river rafting, Kali gandaki rafting, Arun river rafting, Tamor rafting are most popular rafting trip in Nepal. Nepal rafting can do after trekking, peak climbing, expedition or any Nepal package tour or we Apex Nepal Adventure Pvt. Ltd arrange only river rafting adventure in Nepal. 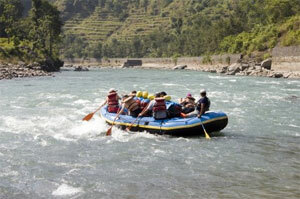 Nepal river rafting can do from 1 /2 days to 12 days as per traveler’s wish and holiday frame. Kayaking in Nepal is another adventure trip in Nepal to share wonderful country, culture with depth experience in this field to give you an excellent opportunity to explore the remote countryside. Nepal Rivers will find the world's most thrilling whitewater rafting with a wide range of difficulties, warm water and bug free beaches for camping while river rafting in Nepal. Rivers are graded on a scale of one to six, with one being a swimming pool and six a one-way ticket to your maker. Nepal White water rafting is negotiating river rapids and obstacles in an inflatable rubber boat with a team of up to eight people and a river guide. Rivers are graded from easy to near-impossible according to their size, the intensity of their rapids and the difficulties that may affect rescue attempts. 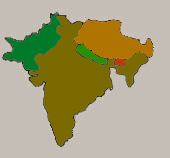 Apex Nepal Adventure Pvt. Ltd carefully supported for all river expeditions are through fully equipped with expert professional guides, safety kayakers with countless experience. We ANA arrange Nepal rafting trip around the year with fully personalized service !